Staple meal from Twenty, beef and pepper stir-fry. Photo by Donna Turner Ruhlman. When your computer crashes, you find out just how precarious your life is without technology. None of yesterday’s work was backed up, so that’s what’s going on here! Today will be spent trying to restore what I can. Life will be normal again, I suppose, soon but not now. Thank goodness for good partners (viz Donna), wonderful assistants (thank you, Emilia! ), and easy staple meals that you can count on, meals that are a breeze to prepare and a comfort to eat at the end of a frustrating day. The following is a weekly staple dinner in the Ruhlman household, a simple beef stir-fry, published in Ruhlman’s Twenty, which happily just won both a James Beard award and an IACP award. Wishing all a productive day and good food throughout (and don’t forget to back up your work!). Make the sauce: In a bowl, combine all the ingredients. Place the beef in a medium bowl and season with two three-fingers pinches of salt. Add the scallions, garlic, and ginger. This can be done a day ahead of cooking. Heat a wok or large, heavy-bottomed sauté pan over high heat for 5 minutes. Add the oil and then the chiles (if using). Cook, stirring, until the chiles are black, 30–60 seconds. Add the beef mixture and spread it as evenly as possible across the surface of the pan. If your pan isn’t big enough to spread the meat in one layer, cook the beef in two batches. Let it cook for 1 minute or so without stirring, then toss and stir for about 1 minute more to cook the meat evenly. Make a well in the center of the beef mixture and pour the sauce into it. Stir the sauce well to make sure the peanut butter melts into the sauce. When the sauce has started to simmer, add the bell peppers and return the liquid to a simmer. If you wish, you can cover the pan for 1 minute until the liquid comes back up to heat. Add the peanuts and cook until the vegetables are tender, about 2 minutes. Stir in the cornstarch/cornflour mixture. Remove from the heat. Season with the sesame oil and garnish with the sesame seeds, if desired, and serve. My recent post on chicken curry with cashews. One of Emilia’s favorite restaurants in Chicago is chef Bill Kim’s Urban Belly. Spicy pork lettuce cup wraps recipe from White on Rice Couple. congratulations on the awards! they well deserved. my daughter has sent me all your books over time. I bought Twenty because my friend and I started cooking when we were suffering from empty nest (and empty wallets since between us we had 5 in college and we’re both single mom’s. we’re going to work our way through your book and post on our blog. we’re a bit of lucy and ethel but we are sincere in our efforts. again congratulations. you are a remarkable writer. congratulations on the well deserved awards. my daughter has sent me all your books and they are all lovely. my friend and i bought twenty. when our kids started leaving for college we had empty nest and since we were single moms, empty wallets. we plan on working our way through the book and posting about our experience. we’re a bit like lucy and ethel but we’re sincere in our efforts. again, congratulations! 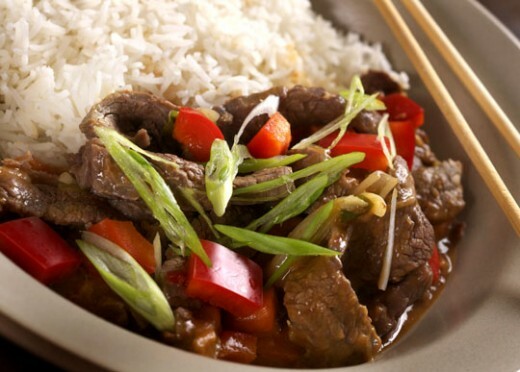 This beef stir-fry is very delicious! Congratulations on getting the James Beard and IACP award. Made this last night. Stir-frys are a great staple meal and this one did not disappoint. I like the addition of the fish sauce, too. Dude. A 20 ingredient WEEKLY staple? 20 ingredients and that’s without you making your own hoisin sauce. Uhhhhhhh . . . . I don’t think it matters how many ingredients are in a meal/recipe, if they are something you have on hand. The only thing I don’t currently have in my pantry/fridge is the black bean sauce.